Last year, in an effort to increase WBAI membership and participation throughout the entire State of Illinois, the Officers and Board of Directors of the WBAI approved the creation of 16 seats in what is now known as the WBAI’s House of Delegates. The House of Delegates is divided by the four Illinois Appellate Districts with four delegates representing each of the districts. This year, the First District will also have four delegates, outside of Cook County. Each delegate has the responsibility and privilege of promoting the WBAI throughout the state, including promoting its mission and increasing membership. Each delegate must be a member in good standing of the WBAI and licensed in good standing in the State of Illinois. Each delegate shall have the right to participate in WBAI board meetings for membership purposes only, but shall not have the voting rights or privileges of Officers or Directors under the terms of the WBAI Bylaws. Each of these delegates will be elected by a majority vote of the WBAI’s current Officers and Board of Directors. Anyone interested in holding a seat in the House of Delegates should submit their resume and the attached application form by email to wbai@wbailliois.org by 5:00pm on 9/25/15. For further information, contact Jennifer P. Irmen at jpi@bcilaw.com or312-600-7538. Each delegate will serve for two years. Create a committee of at least five members within your assigned district to increase WBAI membership and participation. Coordinate two new membership receptions a year to recruit new members within your assigned district with the WBAI. Coordinate two new membership programs a year within your assigned district with the WBAI. 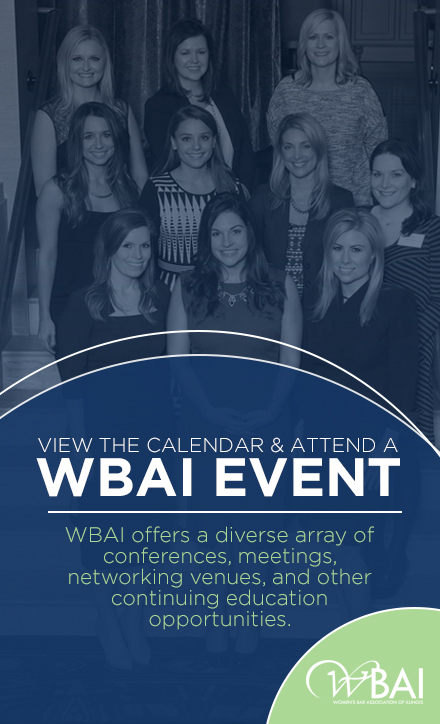 Develop relationships with other local county bar associations, including attending at least three of their events or programs a year to increase visibility of the WBAI. Report your progress to the WBAI Board on a quarterly basis. A true commitment to increasing statewide membership and participation for theWBAI.